Senior Kelli Prange searches for an open teammate during a women's basketball game against Richmond Saturday. For the first time in five years, women’s basketball failed to secure a bye through the first round of the Atlantic 10 tournament. As the No. 5 seed, the Colonials (15-13, 10-6 A-10) will host No. 12 La Salle at the Smith Center Tuesday night. The game’s winner will head to Richmond, Va. Friday for the remainder of the bracket. Head coach Jennifer Rizzotti said GW’s recent momentum and growth since the beginning of the season has set the team up for a competitive showing in the postseason. The Colonials won six of their final eight games of the season and defeated five conference teams by single digits, but lost to Richmond 49–36 in their last regular season contest Saturday. They had been consistent defensively, and four of GW’s seven single-digit turnover games occurred over the past month. GW’s offense struggled against the Spiders to get to the basket at a high rate or sink distance shots. The Colonials shot just 3-for-17 from three-point range and scored a season-low 36 points on the game. They were led on the day by senior guard Brianna Cummings, who scored 11 points. Senior guard Camila Tapias said she and her teammates recognized that the difficulties could not continue into the playoffs and that there are areas that should be improved immediately. The loss was GW’s first regular season-ending defeat in the past six years. Although Cummings said she was disappointed to lose on Senior Day, she added that she and the other three players in their final year are more concerned with finishing their careers off with wins in the conference tournament. No player on GW’s current roster has played an opening-round game in A-10s. Cummings said although the team has a lower seed and an extra game, she also sees the benefit in playing at home and keeping the team in game form through next week. To reach a hosting position, the Colonials overcame a 3-7 start to the season, including a four-game losing streak in December. They also started conference play with a 4-4 record, with more conference losses in the opening eight games than in any of the previous three years. GW relied heavily on its freshman to play significant minutes in a lineup that was not that deep. Freshman forward Neila Luma leads the freshmen with 6.6 points per game and a team-high 6.7 rebounds per game. 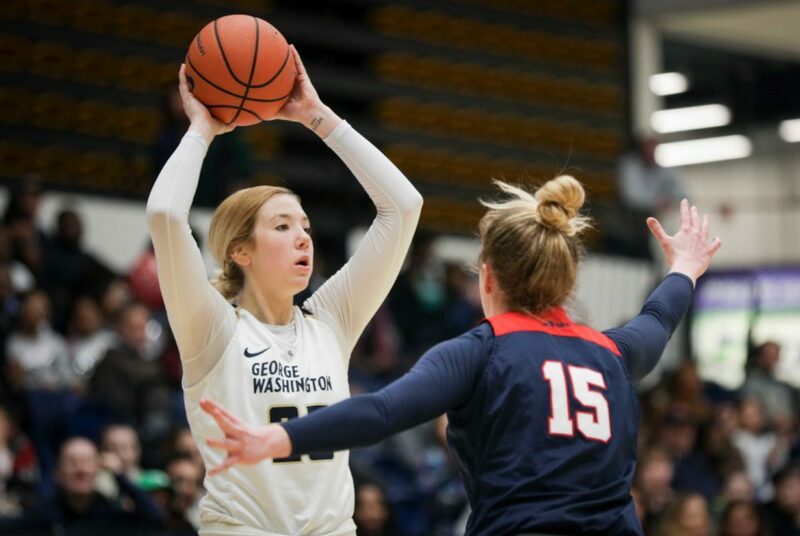 She has developed into a crucial member of GW’s starting lineup, providing an inside presence when Prange handles the ball on the perimeter or gets subbed out. Rizzotti said the team has grown significantly since the opening game, both in playing with each other and competing in close games. She said the team’s difficult out-of-conference slate forced them to learn from their mistakes earlier in the year, preparing them for a strong late-season showing. “Why I’ve been pushing them so hard is because no matter the heartache they may feel today or they may have felt in November or even in preseason when the workout was hard, I want their heart to feel lifted when this is all said and done,” Rizzotti said. Earlier in February, GW defeated La Salle by 15 points after a commanding second-half effort. The Explorers shot a higher percentage during the game, but the Colonials made eight shots from behind the arc and led the rebounding battle by 10 – their largest margin of the season. If GW wins Tuesday, Rizzotti’s squad will face off against the winner of George Mason and St. Bonaventure, who also match up Tuesday night. The Colonials defeated the Patriots twice during the year and the Bonnies once this month. This article appeared in the February 26, 2018 issue of the Hatchet.